All the best for your presentation! You have a wonderful blog that you can talk about (and FB and twitter). I really enjoyed this festival the last time I went. The presenters were informative and I had the opportunity to have an assessment of my work too. What I heard and saw has stayed with me. I’m glad you got a lot out of it last time. Pity you can’t make it this year, but thanks for the good wishes! 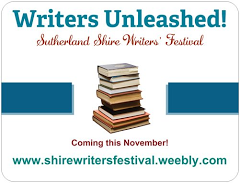 I enjoyed your workshop last weekend and I’m certain your audience at Writers Unleashed will take away lots of great tips! Thank you – and I hope so! Good questions! I’ll be covering them at the festival. Are you coming along? So exciting for you, Stella. You can be proud of your accomplishments this year. Thank you, Evelyne, I think we both can!